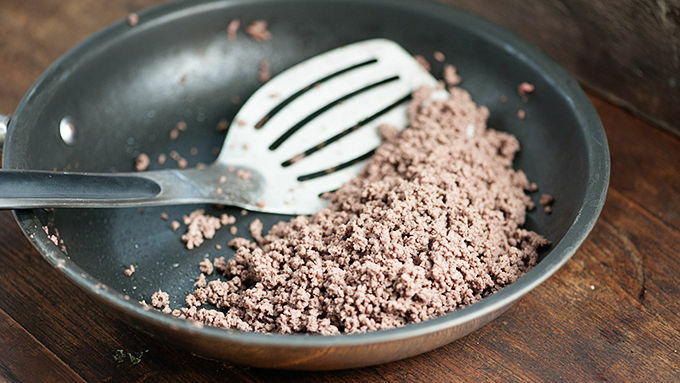 Brown the ground beef in a medium skillet over medium heat. Drain fat. Once it’s cooked you’ll blitz it in a food processor or blender until it’s very finely ground. (You don’t want big chunks of meat, or it will be hard to pipe.) Stir in the cheese sauce. Set aside. Heat 3 inches of oil to 375°F in a deep pot. When the oil is hot, add the biscuits one at a time, being sure not to crowd the pan. Fry for 2 minutes on each side or until golden brown. Remove with a slotted spoon and drain on a paper towel-lined plate. Repeat until all biscuits are fried. 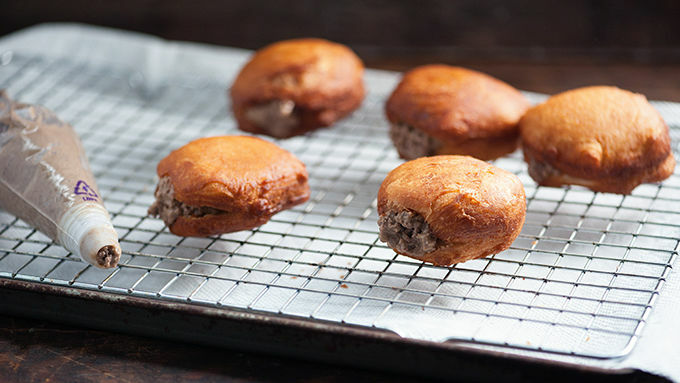 When the fried donuts are cool enough to handle, add the ground beef and cheese to a piping bag fitted with a large holed tip. 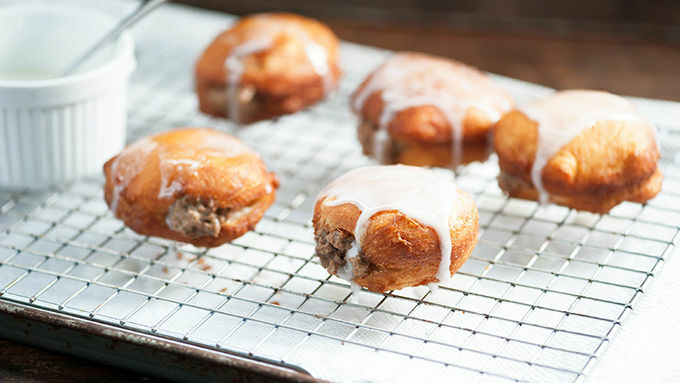 Poke the tip into the side of a donut and squirt in the beef mixture. Repeat with remaining donuts. 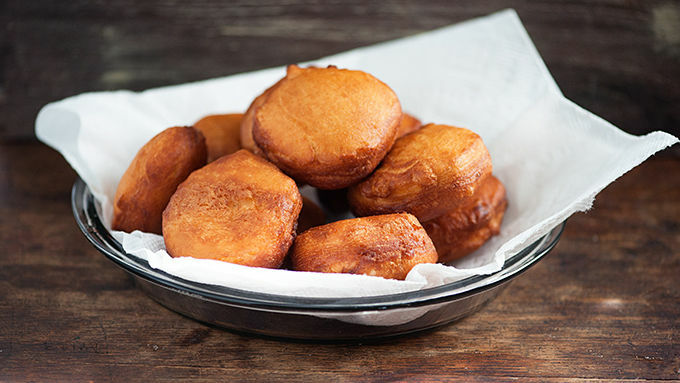 Place the filled donuts on a cooling rack over a cookie sheet lined with paper towels. Whisk together the powdered sugar and milk in a small bowl until smooth. Add more milk to thin the glaze, if desired. Spoon the glaze over the donuts. Is it lunch? Is it breakfast? Who cares, it’s amazing. So apparently there’s a cheeseburger joint in Philly that is stuffing burgers inside of donuts. I mean, I’m not sure what’s going on in the world right now, but I thought y’all might appreciate being able to recreate this at home. Because sometimes you just need ground beef squirted inside a donut, right? Maybe? I’m not going to assign this recipe a time of day—breakfast, lunch, whatever. It’s a burger inside a donut and if you’ve made the decision to eat this, then you’re awesome enough to make the decision about whether it’s breakfast or lunch food. This is actually quite easy, so put on your mad scientist chef’s hat and let’s go! 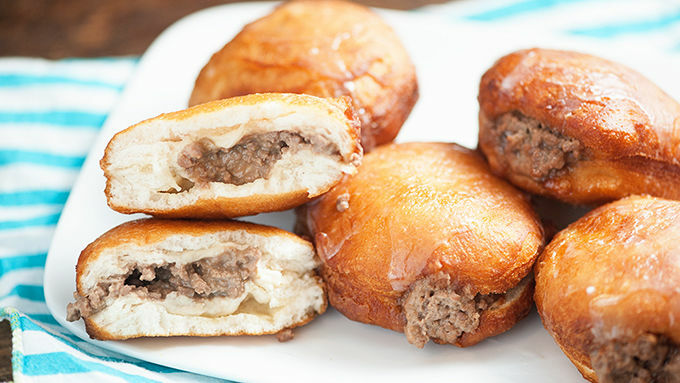 Golden donuts stuffed with cheeseburger filling. Yup. This just happened. It’s kind of glorious.